Sturdy yet beautiful wardrobe perfect for your dressing room, bedroom or living room. Available in different colour combinations. 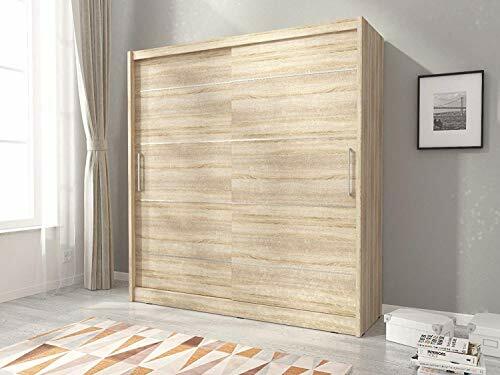 Size: Height: 200cm (6ft 6inch) Width: 180 cm (5ft 10inch) Depth: 62cm (2ft) Weight: 165 kg The wardrobe is made of high quality laminated board 16mm thick. Equipped with a professional system SEVROLL MICRA (aluminium rails and wheels with bearings) Both rail and shelves provide lots of space for your clothes and makes storing easy. Comes with additional shelves. PLEASE BE AWARE: Delivery may take longer to EH, G, KA, ML, TD. Delivery to AB, BA, BH, BN, BT, CA, CF, CT, DD, DG, DT, EX, FK, HS, IV, KW, KY, LD, LL, NR, PA, PH, PL, PO, SA, SO, SP, SY, TA, TN, TR, TQ is UNAVAILABLE.